Jen Vogel Gotantas is both clinic director and owner of Axis Sports Medicine. She has been doing whatever it takes to get both the visitors and locals of Summit County back outside since 1993. A New York girl at heart, she graduated from Ithaca College and, of course, is an avid Rangers fan. Jen has kept her practice current, earning certifications in Orthopedics, Trigger Point Dry Needling, and Pilates. To enhance her skills and grow her practice, Jen earned her Doctorate of Physical Therapy in 2014. 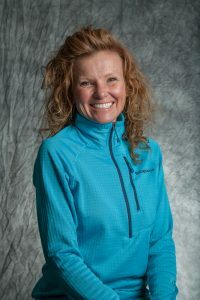 Using a hands on approach, she specializes in a wide variety of sports, spine injuries, post operative care, and Lymphatic drainage. When not “needling” patients, Jen can be found skiing and biking in her backyard or in Fruita, CO… usually with a four legged friend in tow! Jen was married at Arapahoe Basin and took a chair lift ride to the ceremony. She is TERRIFIED of snakes and cannot talk to anyone in the morning, before a cup of hot black coffee. Or two.